Complex is designed for continuous accumulation and archiving of the results of work of radiation and process control systems and to provide an access to this information to the registered clients by local and global networks. • At hardware level – RS-422 (RS-485) using the cable lines. 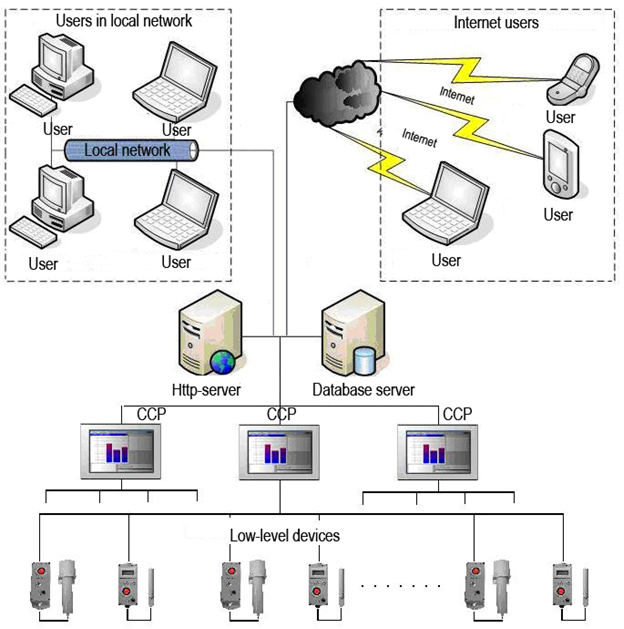 Can exchange information using radio modems, and via Ethernet lines. Upper level of STC creates servers (WEB-server and Internet server), and a complex of programs „Atlant-Protocol. “ Hardware-based and software means provide storage and authorized access to information about the work of STC. User-level form personal computers with an access to upper-level servers (LAN, Internet), and authenticated in „ATLANT-Protocol“. specialized software is not installed On users‘ computers. WEB-browser (MS Internet Explorer, Mozilla Firefox, …) is used as a client program. In the STC of primary-level, with the number of simultaneous connections (no more than a hundred), hardware server consolidation of the upper level is possible. A smaller number of simultaneous connections allows hardware unification of upper and middle levels. The most common STC can only consist of units of lower and middle levels. • radioisotope density meters, level meters, gamma-relay..